This beautifully decorated, cabin is nestled in the peaceful seaside town of Umtentweni, away from the hustle and bustle of everyday life. It has 1 bedroom and 1 bathroom, sleeping 4 guests. The cabin comes fully equipped for a self catering get away, a lounge with 2 large sleeper couches and offers maid service (Optional extra). Safety is assured with secure parking behind remote controlled gates, alarm system and fully enclosed property. 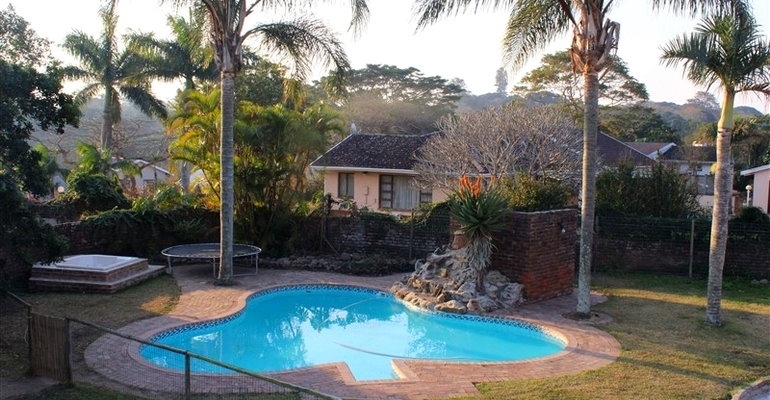 The children (and young at heart) are invited to enjoy their blissful family moments at the braai and swimming pool area that also include a jacuzzi, entertainment area and large garden that is pet friendly. This charming cabin is nestled in peaceful tranquillity yet is still close to all amenities and is only 3km from the beautiful Umtentweni main swimming beach and kiosk. The Beach is protected by lifeguards and shark nets, and there are lots of adventure sport options in the area. R100 fee for the heating of the Jacuzzi, it is available cold at no charge. R100 daily fee for the use of the aircon.